The extremely popular KATSUYA chain has opened up at LA LIVE, and the restaurant brings its high quality Japanese/Oriental fusion cuisine to Laker fans and anybody else who ventures down to the Staples Center. Master chef Katsuya Uechi has brought many of his signature dishes to the restaurant such as Crispy Rice with Spicy Tuna and Spicy Albacore with Crispy Onions. The service at the new location is brisk and professional and the young hip crowd were enjoying selecting from the vast array of martinis on offer at the bar. As for the food I decided to go for the Katsuya tasting menu ($65), a six course tasting extravaganza that features many of the chef’s specialties. That included the Katsuya Ceviche with sashimi and citrus ponzu and the very special Crispy Rice with spicy tuna, a dish that helped Katsuya really make a name for himself. Included in the tasting menu is a version of the excellent Kobe Filet with Foie Gras that is smothered with a highly concentrated plum wine reduction. If you were to order this separately on the menu it costs a reasonable $29. Of course the sushi here is highly rated, and the sushi sampler is part of the tasting menu or can be tried separately ($30). It’s all here, tuna, albacore, yellowtail, salmon, halibut, shrimp, octopus, water eel and egg served with a California roll. Freshly prepared and exceedingly tasty, the sushi here is a sure fire winner. Sea food lovers should go for the Miso Marinated Black Cod ($22) with the sweet miso enhancing the cod flavor to another level, and if you are really hungry the Stripped Baze ($55). This standout of two large fillets of striped bass served Szechuan style is considered the chefs most dynamic dish. Other standouts include the Raku Mori “Japanese Seafood Platter” at $55 for two that includes King crab legs, amaebi, tuna/octopus poke, kiwi scallop, oysters and mussels. 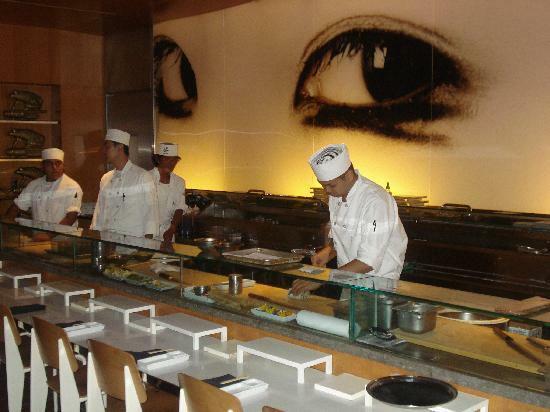 Other branches of KATSUYA are in Brentwood, Glendale and Hollywood. At the time of the review the restaurant was not open for lunch, but that situation has now changed with their August opening.